Catriona Ferguson, the Director of the New Zealand Book Council, joined me last week to help select the winners for The Third Fabulous Poetry Competition. We both felt it was a wonderful way to spend a morning. I had made a long list of fifty schools that submitted exciting entries. With much reading and thinking, I had then selected three finalists in each region. It was tough job as there were standout poems every way I looked. In the end, I returned to my competition brief and selected schools that sent quality writing in a range of ages and styles. Once I got down to around 20 schools, I took into account editing as well as poetic zim. My three finalists all submitted poems that made me go ‘aah!’ ‘amazing’ ‘lovely’—just like when you watch fireworks. Today I am posting the names of the finalists and the winners. On Tuesday I will post a selection of poems from the winning schools. On Thursday I will post some standout poems that I loved in my long list of 50 schools. The winning schools get a two-day visit from me courtesy of The New Zealand Book Council and a year’s membership to the organisation if they don’t have one. Congratulations to the finalists and the winners. A special mention to West End School. I will scan and post some of your poems as yours were my favourite presentations. Bravo! 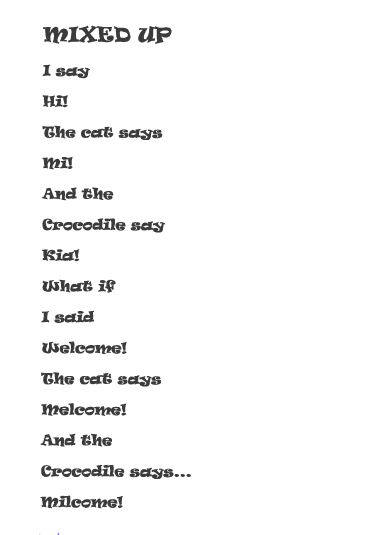 This entry was posted in Poetry and tagged Gladstone School, Russley School, Te Aro School, Third Fabulous Poetry Competition on June 30, 2014 by Paula Green. Recently I got to judge the Poetry Competition at St Kentigerns Girls’ School. The girls recited their poems beautifully and each poem had little nuggets of gold. The detail was magnificent, the words made music and the moods were magical. I loved the way one moment I laughed, the next moment I pondered and then next I felt moved. It was very hard picking winners because as Barbara Else said at The NZ Post Children’s Book Awards, everyone was a champion. I borrowed what Joy Cowley said at the awards (‘We are a people of children’s books and people associated with children’s books are lovely people.’ ) to say we are people of poetry and people associated with poetry are lovely people. I also borrowed what Keri Kaa said, ‘There are many words and images you can use, but only the right combination will do. When you have the right combination the words and images are so much more.’ That is just right for poetry! The Year 1 and 2 poets performed their poems exquisitely (they don’t get judged). 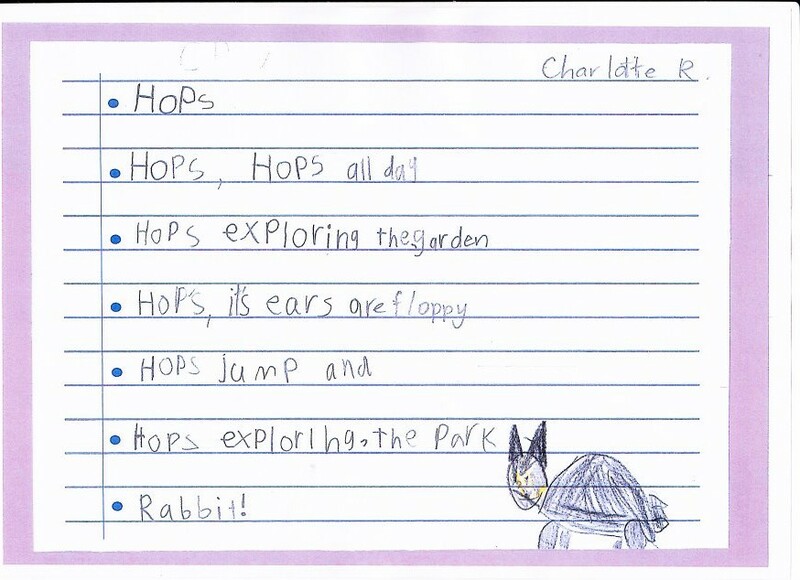 The poems I scanned are year 1. I want to share their poems first. After that you can see the winners. Leaves are whirling, crashing and floating from the trees. Leaves are dazzling on a summer’s day. I love old coloured leaves. Quiet flaky leaves almost shiver in the breeze. Of gold, red and yellow. I see children playing in humongous piles of leaves. and I am the meanest pirate in all of the seas. My hair is gold and plaited. My bunny is called Apples. I like to eat peach. I have a dress that is gold and has peach on it. I have a friend called Lola and Emma. I have a compass that is bright orange. And I have a sword that is bright orange. My ship is called the Caribbean Peach. It has a big peach on it. Apples likes to eat apples. I wear a pirate hat with a crown on it. Guess what my favourite letter is aargh(r). Get it! I was there hearing the news when Edmond was born on July the 20th 1919. It was such an exciting moment. I was there knowing that my one and only owner would soon come. When Hillary’s interest in climbing came at the school trip to Mt Ruapehu, I was very excited then and always jiggled about. I was there for the first time when he climbed Mt Oliver in the Southern Alps—It was very cold and frosty. I was there in his cupboard when he left me for awhile when he applied to join the NZ Air Force in thhe horrible World War 2. I was there at Everest. Hillary and Tensing Norgay set out for the summit. We were at 8,848 metres high from sea level. We went hard for the last few metres—the last ascent past the Hillary Step was the hardest part to climb. We chipped in the final steps and made the summit. I’m Sir Edmond Hillary’s ice axe. Meows so loudly at night! piles of gold and brown. Autmn is a season of colour. To give his life to war. Has caused our eyes to dim. The war boys, the war is for all! God is on the side that’s right. When you hear the cries at night. Note from Paula: This poem got me thinking as sometimes it is hard to tell where the right is in war. I sometimes wonder if there is right and wrong on all sides. Droplets of cranberry red wine. What happened when deep in the snow I fell. And I went home crying. Wishing I was on a beach with warm sand. I’d reached the small well when I spotted a stream. I followed the water, I walked in a dream. You’d think I was mad if I told you, no doubt. This entry was posted in Uncategorized and tagged St Kenitgerns Girls School on June 27, 2014 by Paula Green. … that is rather special! Lots of things coming up. This entry was posted in NZ Author, Poetry on June 26, 2014 by Paula Green. My visit to Milford School uncovered some cool ideas for Book Week. The lovely librarian showed me some of the Poetry Books classes had made and told me the school is dressing up in their favourite characters from poems for their Book Parade. Two very good ideas. It was a cool school to visit. Thank you! is in my school library. 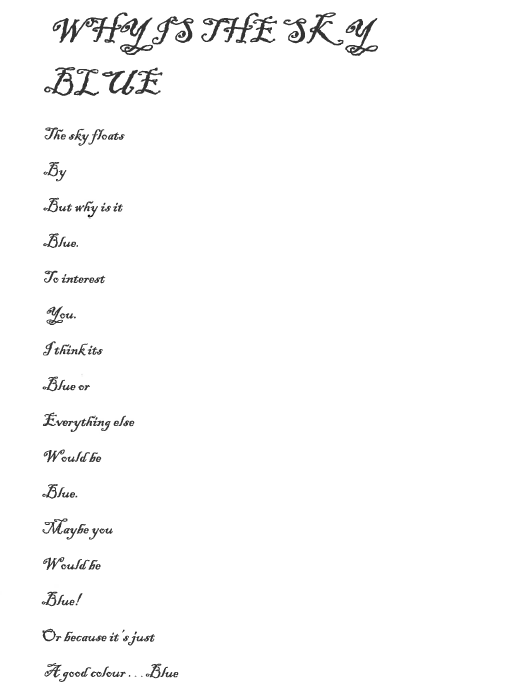 This entry was posted in Poetry and tagged Milford School on June 26, 2014 by Paula Green. 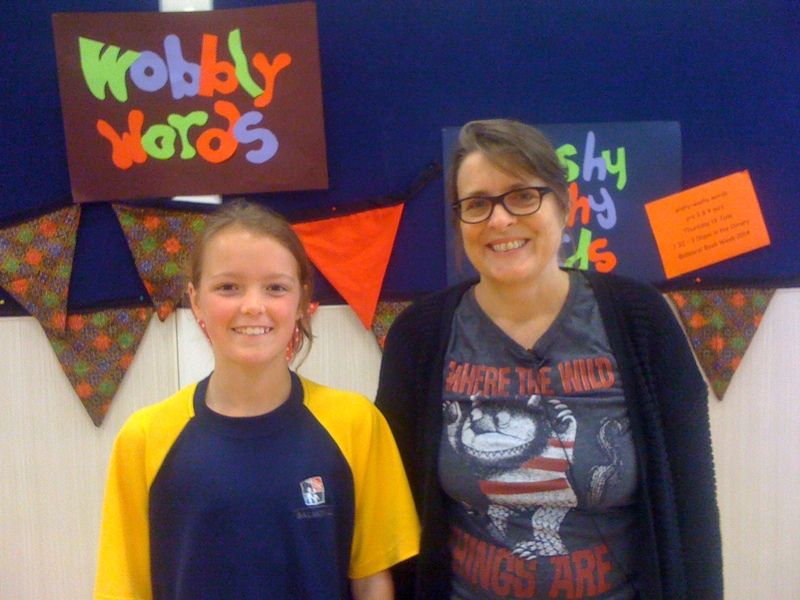 I was so delighted to meet Phoebe at Balmoral School’s Wobbly Word Week (Book Week). She sent in an astonishing poem about her Gran for one of my challenges so I sent her copy of Wonder ( a book I love so much). She told me she has read it and loves it. It is a book for Year 7 or 8 but maybe some Year Sixes might like it too. If I come to your school and you have sent me poems do come and say hello! You can read Phoebe’s poem here. 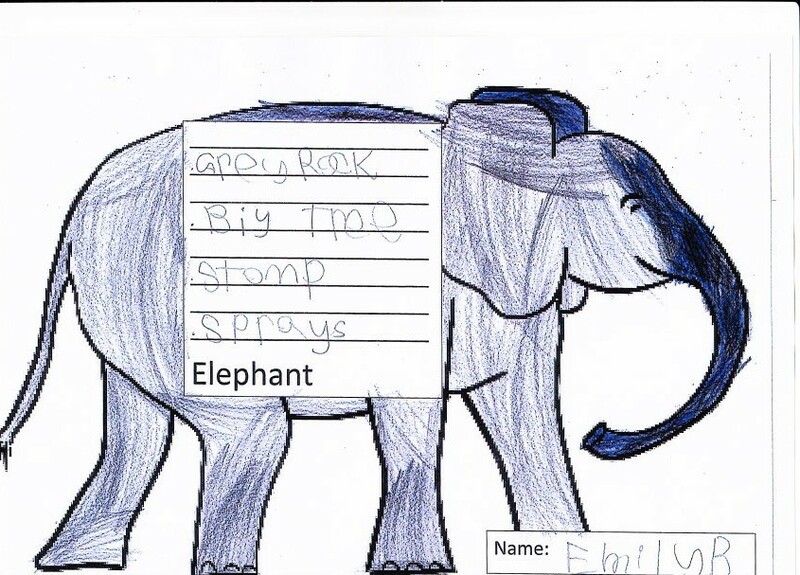 This entry was posted in book week, Poetry and tagged Balmoral School on June 26, 2014 by Paula Green. 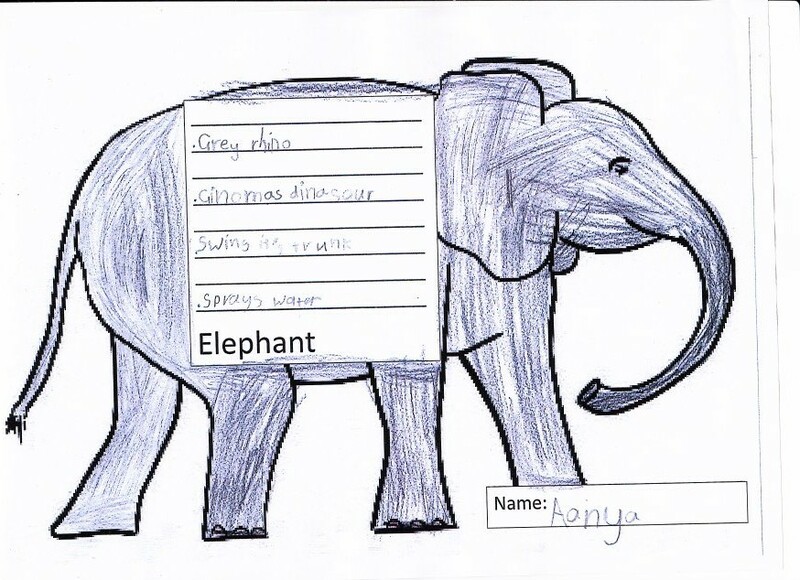 Haley’s poem was for the mixed-up-language poem inspired by Margaret Mahy’s wonderful story about three animals who speak different languages but get on well. 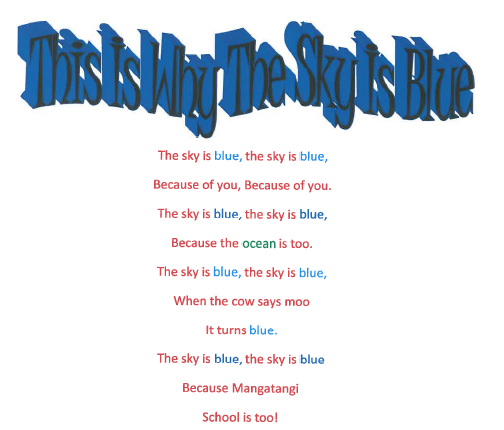 Mangatangi School sent in a bunch of terrific poems for this challenge and the Why The Sky is Blue? challenge so I am going to do something a little different and give a copy of the book to your class (THANK YOU RANDOM HOUSE!). I know you are Year 4, 5 and 6, but the stories are so cool you can take turns to read them to younger children in your school. Anyway, you are never too old for these stories. let me know which one you love the best! 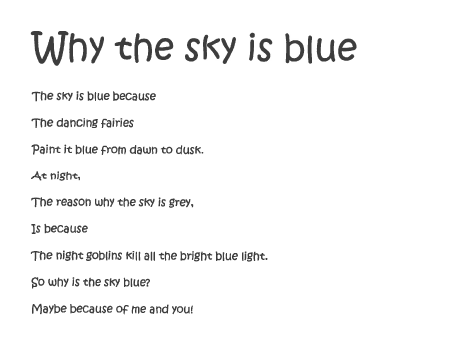 Ewen and Isla also wrote cool poems for the sky question. I loved Isla’s imaginative leaps and Ewen’s idea that blue got there first! to shelter us from the sun so we can sleep. 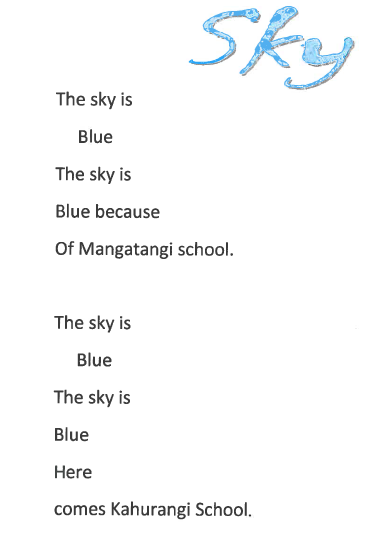 And four poems from Mangatangi School, Pokeno. Imagination is hard at work here! This entry was posted in Poetry and tagged poetry by children, question poem on June 25, 2014 by Paula Green. Last night I attended the NZ Post Book Awards as neither judge nor nominee which was a very fine thing to do! The Auckland Town Hall was like a children’s wonderland. Everyone oohed and aahed when they walked in. There was even a cake under a glass dome on the table, that looked like it had been plucked out of a fairy story. There was a little label saying Eat Me! And so we did! I was delighted to see two of my favourite books do well. I talked about the Supreme Winner and Winner of the Picture Book category, The Boring Book on Poetry Box here. Vasanti Unka was surprised and delighted that her book won. I also talked about one of my favourite novels of 2013, Elizabeth Knox’s Mortal Fire here, in my review of The New Zealand Herald. This book won Best Young Adult Fiction. Joy Cowley said, ‘We are a people of children’s books and people associated with children’s books are lovely people.’ Hear! Hear! Joy won Best Junior Fiction Category. Keri Kaa said, ‘There are many words and images you can use, but only the right combination will do. When you have the right combination the words and images are so much more.’ I totally agree with this and it seems like a very fine recipe for poems. Keri won the Maori Language Award. 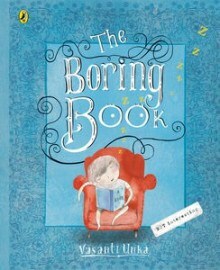 *The Boring Book by Vasanti Unka. New Zealand Post Margaret Mahy Book of the Year and winner of Best Picture Book category. *The Beginner’s Guide to Hunting and Fishing in New Zealand by Paul Adamson. Best Non-Fiction. *Dunger by Joy Cowley. Best Junior Fiction category winner. *Mortal Fire by Elizabeth Knox. Best Young Adult Fiction winner. *A Necklace of Souls by Rachel Stedman. Best First Book. *The Three Bears … Sort Of by Yvonne Morrison and Donovan Bixley. Children’s Choice category winner. *Bugs by Whiti Hereaka. Honour award. *Taka Ki Ro Wai by Keri Kaa and Martin Page. Maori Language award. This entry was posted in Poetry and tagged Elizabeth Knox, Joy Cowley, NZ Post Children's Book Awards on June 24, 2014 by Paula Green.